Bellin. 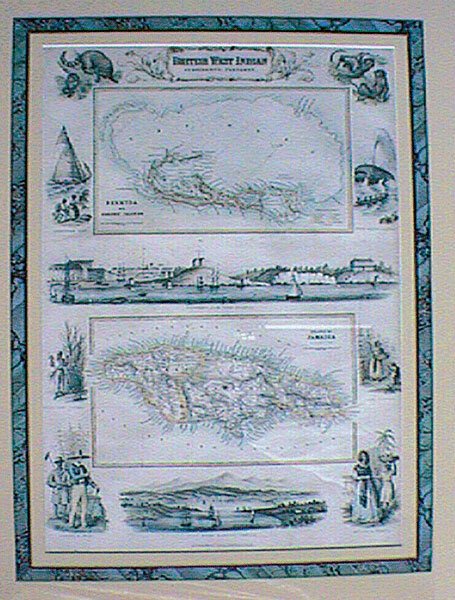 Carte des Isles Bermudes. c1763. Outline colour. 32.5 x 20cm. 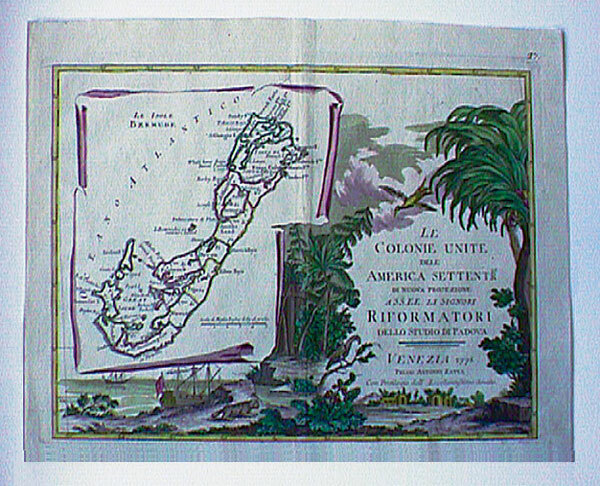 Printed in Paris for incorporation in the Petit Atlas Francois, the Bellin divides Bermuda into tribes and here calls them cantons. Some of the names given are unusual and the cartouche has a rococco shell like feel to it. Blaeu. 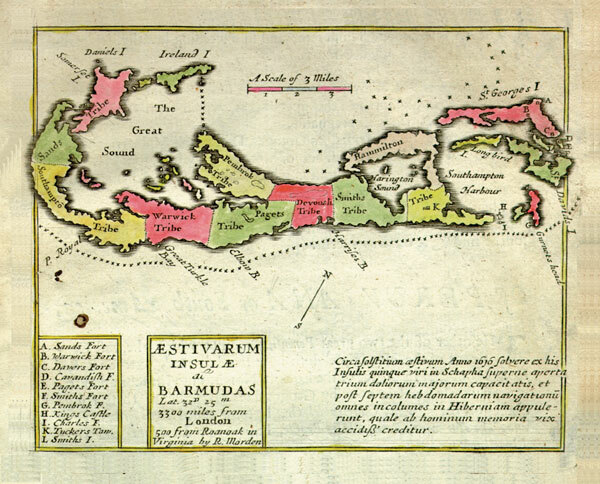 Mappa Aestivarum Insularum. 53x40cms. Original colour. c1635. 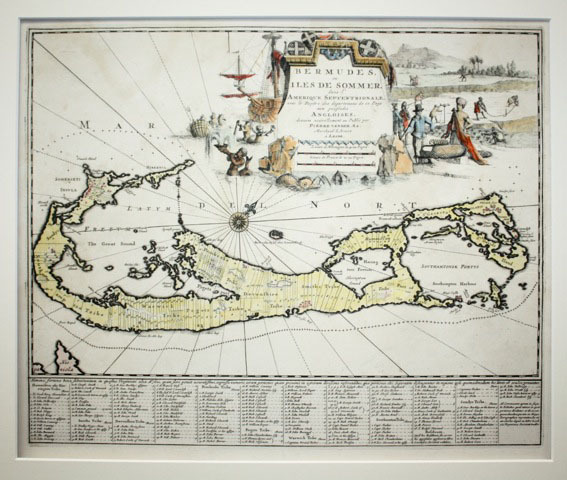 Printed in Amsterdam, this classic map of Bermuda is complete with the names of the shareholders of the Somers Isles Company underneath, together with details and geographical facts of their holdings. Above, in the cartouche, Neptune holds the ship ‘Sea Venture’ in his hand as he cradles the standard of England topped with a crown. Beneath him is a shield emblazened with mermaid-like creatures holding conchs and supporting their catches of fish. A monster completes the scene. Bonne.Isles Antilles et le Golfe du Mexique. 32x21cms. c1783. Hand coloured. 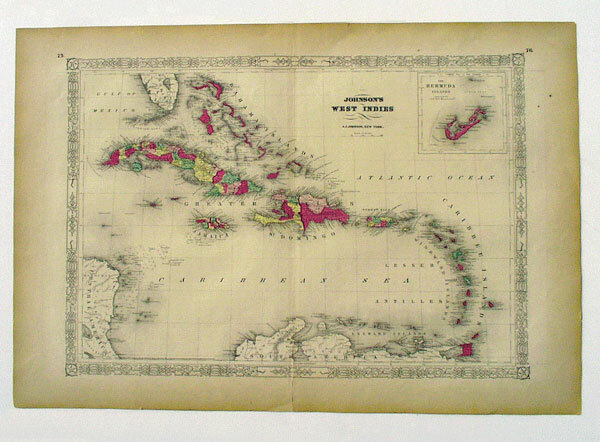 Printed in Paris and appearing in M. Bonne’s Atlas Encyclopedique, this map of the West Indies and Central America is a collector’s favorite because of the prominence given to Bermuda in the top left hand corner. Interesting too is the line given to the reef to the north of the island, while nothing is mentioned about danger to shipping to the south - about which much more was known at that time. Bowen. 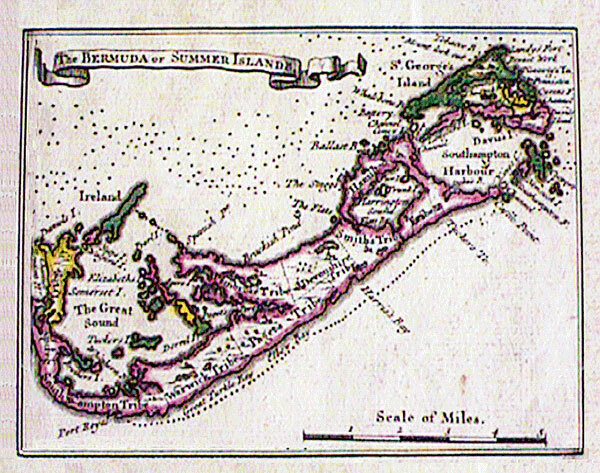 A New and Accurate Map of the Bermudas or Sommers Islands. 21.5x35cms. c1747. Emmanuel Bowen was tired of the horizontal positioning of Bermuda which was the basis of Richard Norwood’s earlier island survey. He writes in beautiful script of the dangers of approaching Bermuda by ship from the north and west, adding that on the contrary vessels on the South Shore can approach to within half a gunshot of the land. Whales, he says, can be caught with success from the end of March to the middle of May off the East End. Hand coloured. 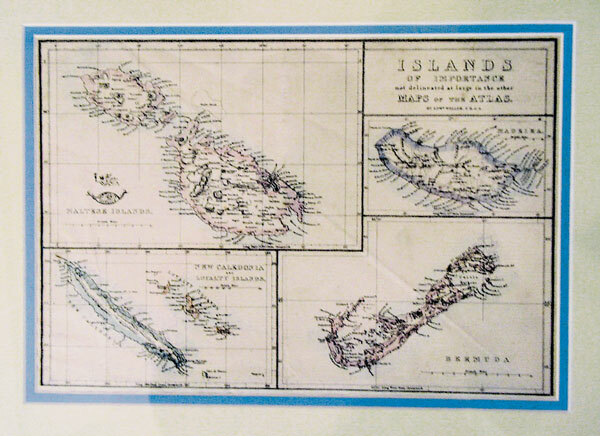 This map appears with St Kitts, the two having the dimensions 44x35.5cms. It is remarkable to note that besides turning Bermuda on its end to resemble a fishhook, Bowen inverts the other island, making it appear as a fishing weight. He obviously enjoyed using the hook and line in his spare time. Chatelain. Des Isles et Terres que les Anglois possedent (Detail). 51x40cms. Uncoloured. full sheet. Bermuda is such a speck as was mentioned earlier that relatively few cartographers surveyed it for themselves. This is certainly true of Chatelain’s map which he had engraved in Amsterdam. One of eight areas depicted as being owned by Britain, Bermuda is sketchy indeed and somewhat shrivelled. It is called The Bermudas or Barbuda(!) and the inhabitants are said to paint themselves blue and to cavort around naked. All this is written in beautiful cursive script in Old French. Very attractive and worth having. N.B. A translation of the French is available for disbelievers. Coronelli Gore. c1690. Uncoloured. 25.5 x 45cm. This segment of a globe of the world was published in Venice by Vincenzo Coronelli, a priest of the church. 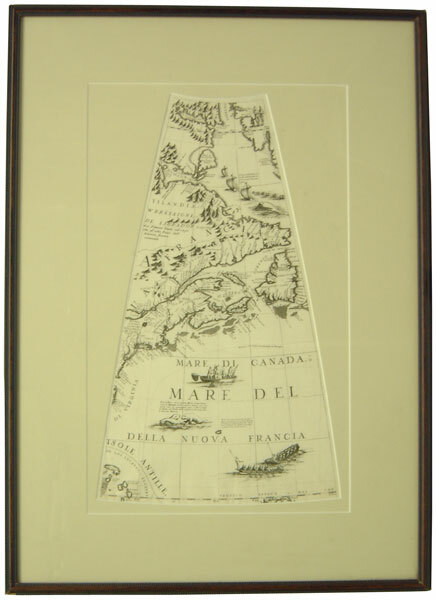 A copper engraving, it shows a strangely shaped Bermuda in the Sea of New France and narrates the accidental colonization of the island by Sir George Somers. Coronelli. Le Bermude. 30.5x23.5cms. One of four islands on a very large sheet. Hand coloured. c1692. Engraved in Venice with the cardinal’s arms beneath, this map occurred in an atlas called ‘Corso Geographico Universale’ which must have been a strange compilation since two of the other maps for this page, Frislanda and The Jan Meyen Islands are fanciful. Quaint too are many of the Bermuda names. Covens and Mortier.(Detail). The Bermudas or Summers Islands. 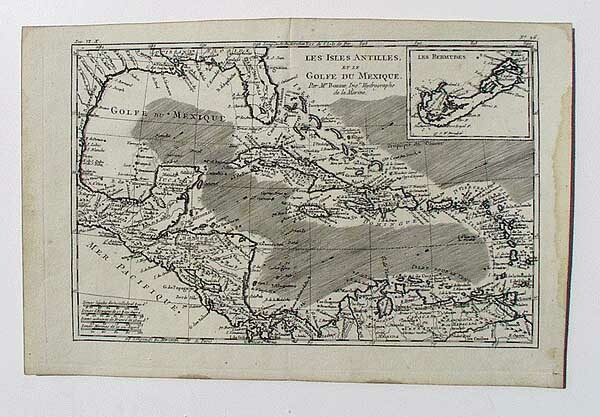 Part of a large map 57x52.5cms from Atlas Nouveau Amstelodami c1757. A significant piece because Bermuda - well before the building of Dockyard- is identified as one of the principal fortresses and ports of North America. Along with Boston, New York, Port Antonio and Cartagena. Crepy. Bermuda and Jamaica. 26.5x20cms. Similar to the Le Rouge but engraved ‘Crepy and with the date 1767. Early colouring. Duval. 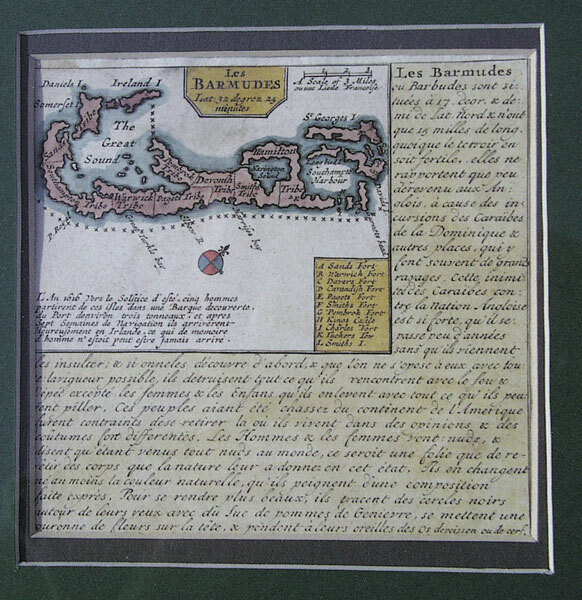 c1690 5 x 5cms A map of La Virginie from a miniature atlas published in Paris .Scarce. The complete atlas was called Cartes de Geographie and was derived from the works of Duval’s uncle, a famous cartographer to the King of France called Nicholas Sanson. 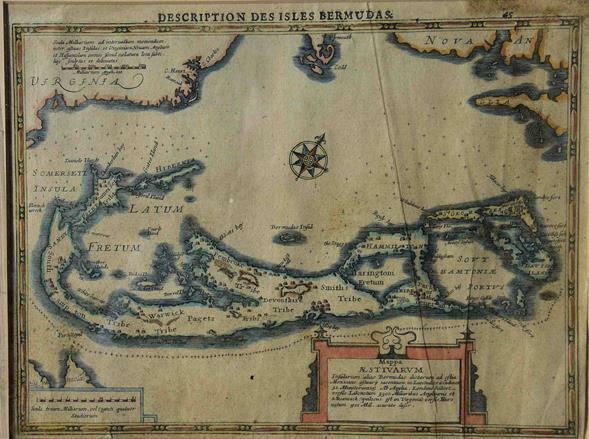 Bermuda occupies the top right of the copperplate engraving. Without benefit of a survey, our island somewhat resembles a caterpillar! The map appeared in five different states between 1659 and 1687. Fullarton. Bermuda or Somers Islands together with Jamaica. 30.5x45cms. Coloured lithograph. c1860. 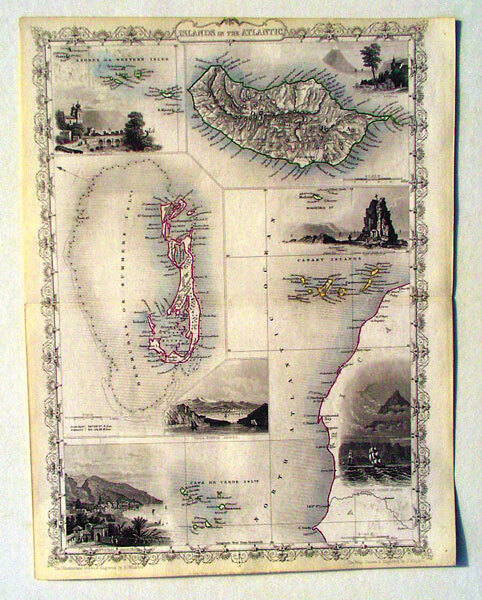 Printed in Edinburgh by G H Swanston and Co, this appealing map is notable for the vignettes which surround it, some of which relate to Bermuda and some to Jamaica. Below the former is a fanciful sketch of Goverment(sic) Dockyard with a now removed hill in the foreground, white cliffs and many storeyed naval buildings. True to life however is the busyness of the place. In 1860 Dockyard was a hub of activity in Bermuda. Gentleman’s Magazine. Bermuda or Summer Islands. 18.5x23.5cms. Outline colour. c1763. J Gibson engraved this map which appeared in a fold-out in the above named London pamphlet of Oct 7th 1763. Of note in a period of time just before the American Revolution is the amount of territory claimed by Britain and reserved for the Indians. Contemporary French atlases of course disagreed and included much disputed land for themselves. Goad, Chas E. Civil Engineers. Fire Plan of St Georges, Bermuda. Mar 1897. Original Colour. 25 x 22 inches. Goad, who was born in England, emigrated to Canada in 1869. By 1875 he had started producing fire insurance plans, proving to be very successful. His plans showed the number of floors and height of buildings. Hazardous construction materials and dangerous chemicals were particularly identified. St Georges, it is noted, had a population of 2000 in 1897. This colour plan was published in Toronto, Canada. Homann Heirs. Die Englische Colonie-Laender. 55.5x48.5cms. Outline colour. Nurnberg 1737. 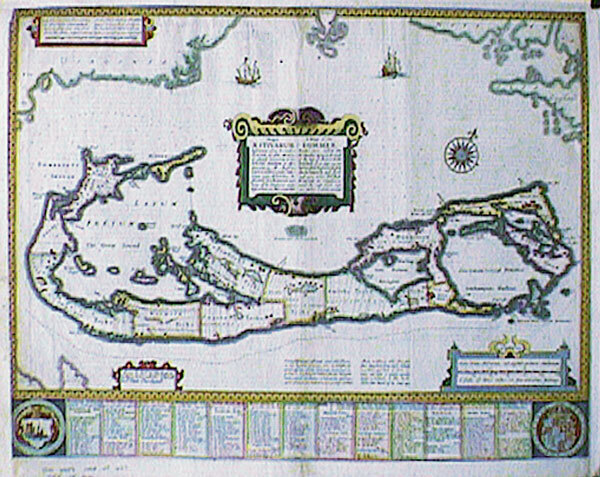 One of the earliest German printed maps of Bermuda, the Island shares the page with St Kitts, Antigua and Barbados, as some of the British Possessions of North America. A tiny Bermudos or Sommers Islands appears apparently as a misprint two miles off North Shore. Decorative colour. Similar to the Blaeu, but with different decorations, the map appeared in various atlases and with texts in different languages until about 1640. The Hondius name is clearly visible above the scale on the lower right side. Hondius. Mappa Aestivarum Insularum. 52x39cms. c1640. Amsterdam. Johnson. West Indies. 1864. 56x40cms with Bermuda inset 10x10cms. 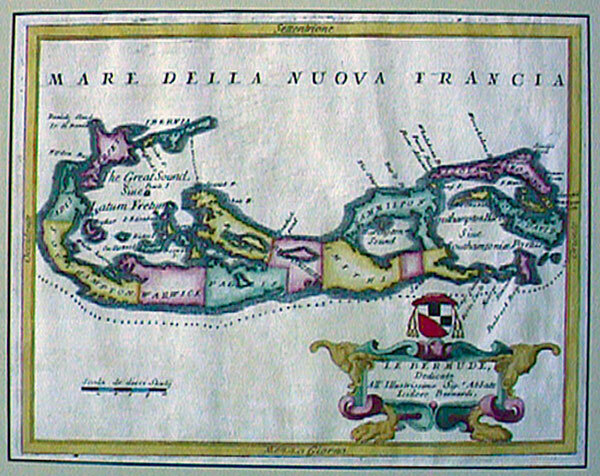 Keulen, Johannes van (1654 - 1715) Fine chart of Bermuda 1702. Early hand colouring. Engraved and published in Amsterdam, Netherlands. Van Keulen published the influential nautical atlas, the Zee-Atlas, and the pilot guide Zee-Fakkel (Sea Torch). 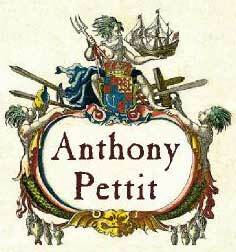 He named his firm 'In the Crowned Pilot', to show royal patronage. He employed the experienced Claes Jansz Vooght as his engraver. It is amazing that these charts still remain intact as they were to be used for actual navigation. Le Rouge. Bermuda and Jamaica. 26.5x20cms. 1746. Outline colour. Paris. 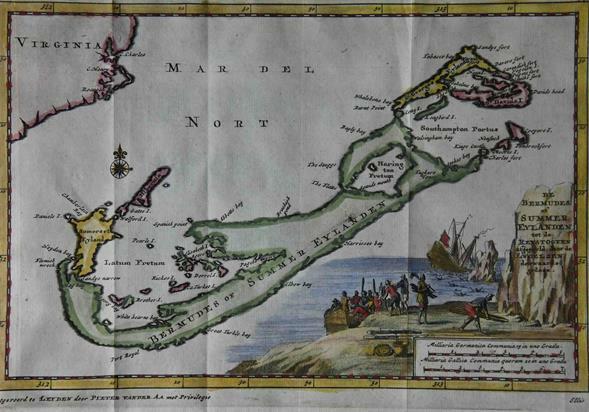 Le Rouge was obviously fascinated by the parish names of the two islands and printed the islands on the same page, with Bermuda getting as much recognition as Jamaica even though it is very much the smaller place. Once again there is that odd little ‘Bermudos’ off North Shore. 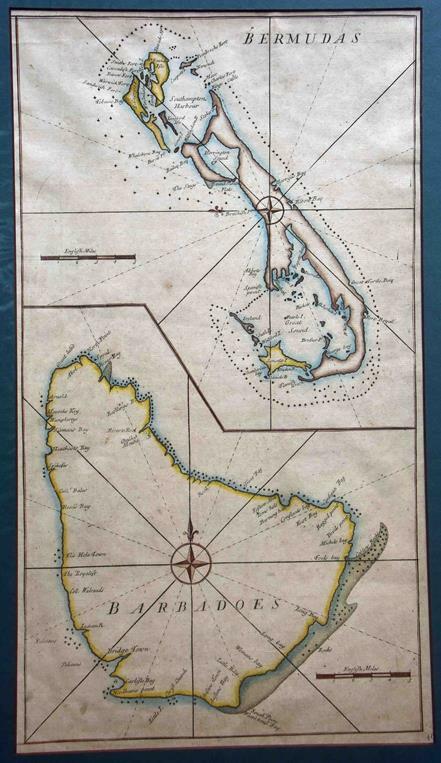 A fine chart of the Bermudas or Summer's Islands from a 1775 survey by Lempriere, but significantly lacking the fresh data discovered by Capt. 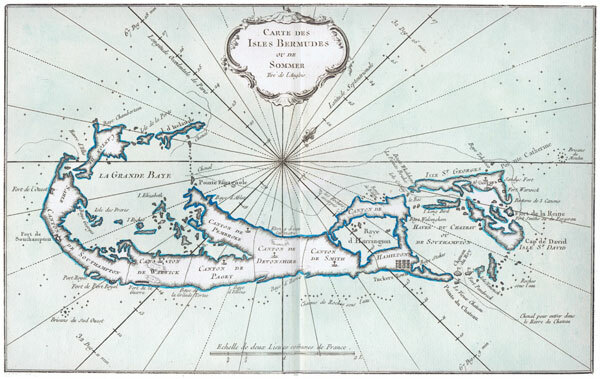 Thomas Hurd and his team between 1783 and 1797 such as the extent of the reef to the north of our islands. 60 x 45 cm. This map appears in the West India Atlas of Thomas Jeffreys of 1797. Uncoloured. Published in London by Laurie and Whittle. Lucas, Fielding Jr (1781 - 1854). 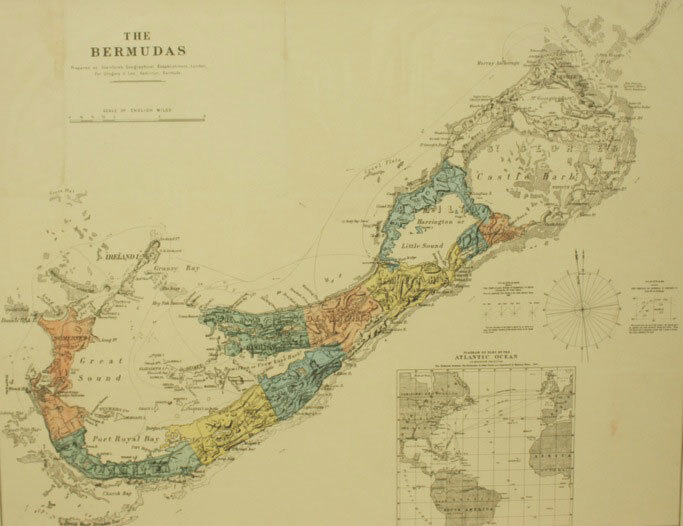 Elegant separate map of Bermuda. 1823 9 x 11 inches. Original printed colour plate. Lucas was a cartographer, an artist and a publisher. 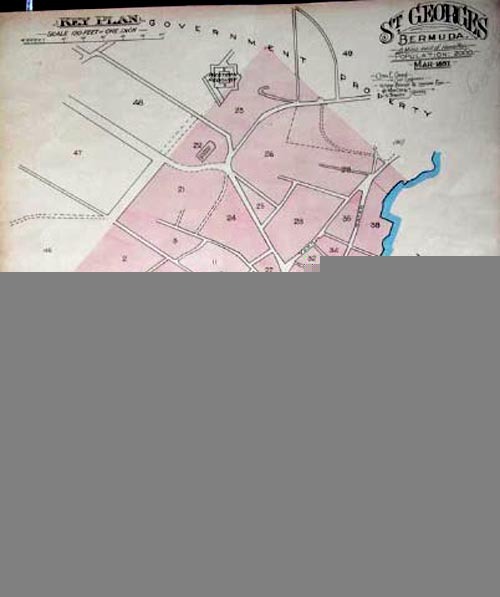 His was the earliest successful commercial map publishing house in the City of Baltimore. The Lucas General Atlas of 1823 was supposedly the finest general atlas produced in the U.S. at the time. 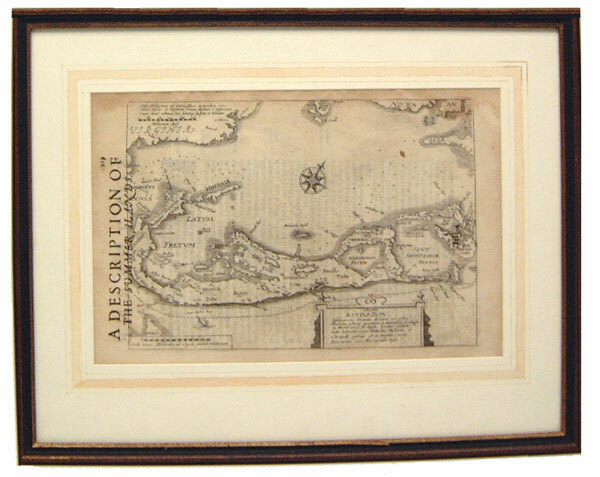 His engraver and printer was B T Welch and Co.
Often referred to as the miniature Hondius, the Mercator when published was in fact a pivotal English map of the island with clear parish divisions and often a separate page of history about Bermuda. It was printed by Michael Sparke and was to have several derivatives. Military Map. Bermuda. 1880 Drawn by hand. 5 x 10 inches. This unusual beautifully executed miniature with delicate hand writing, partly in colour, was the work of a soldier on the island serving between 16th April and 19th November 1880. We know little about him except that he had a passion for sport. Mitchell. 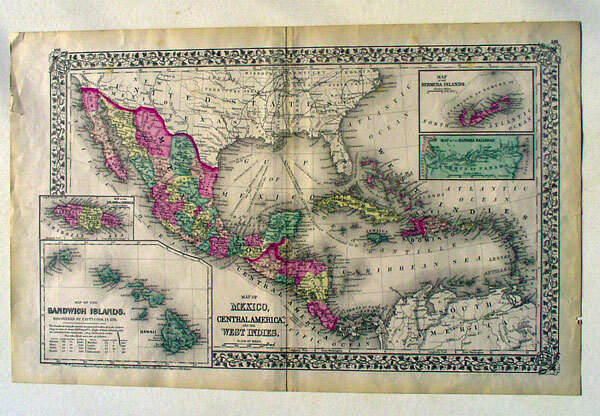 Map of Mexico, Central America and the West Indies. 1871. 55x34cms original colour with decorated borders. Contains an inset of Bermuda 7x12cms, along with Panama, The Sandwich Islands (Hawaii) and Jamaica. Another version 1884 replaces Hawaii with the proposed Nicaragua Canal and a ship railroad through Mexaco. Moll with Part of Providence Island. 27x20cms. 1727. Outline colour. 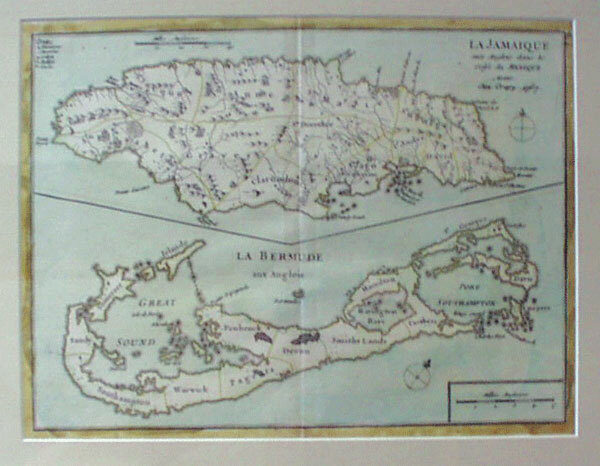 Moll in this map shows a more detailed Bermuda divided into Tribes with castles, forts etc. It appears in the Atlas Minor on one sheet. Providence Island lies off the coast of Central America. Moll, Herman (1678 - 1732). 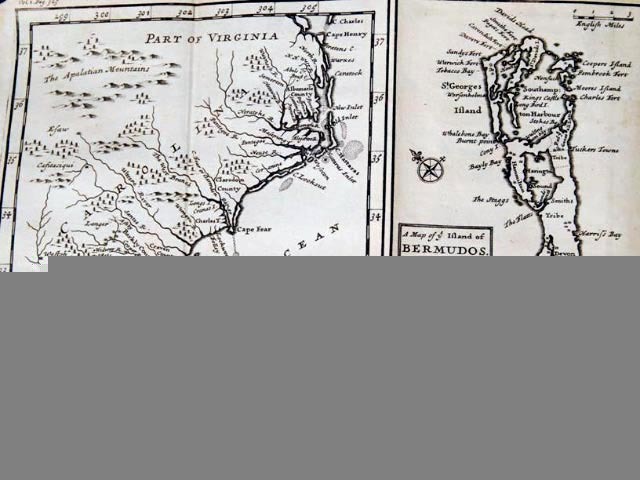 Map of Bermuda and Carolina. 1717 7 x 10 inches. Moll emigrated from his native Holland to London at an early age. In that great city he set up a thriving map publishing business. 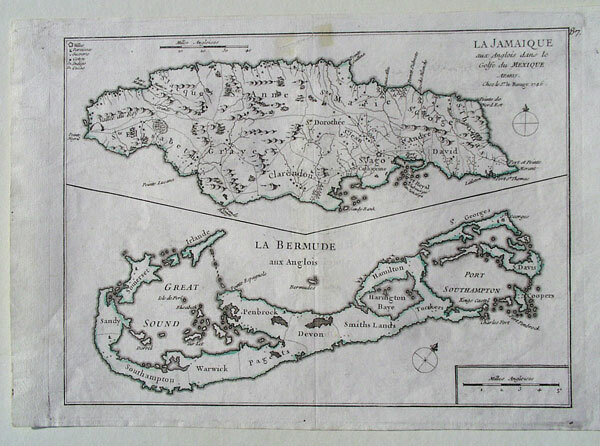 The vertical map of Bermudos appears together with one of the Carolinas showing plantations. Appears in Atlas Geographicus 1711 - 1717 London. Morden. See under Blome Amerique Anglois among the books, Aestivarum Insulae al Bermudas. 14x18cms. Uncoloured. 1688. This tiny pretty little map with English description beneath appears in Richard Morden’s Geography Rectified or a Description of the World, printed in London at the Atlas in Cornhill and at The Three Legs in the Poultrey over against the Stock-Markets. Ogilby. Barmudas. London. 1670. 35.5x29cms. Hand coloured. Appears in an Accurate Description of the New World by John Ogilby, printed by Thomas Johnson. 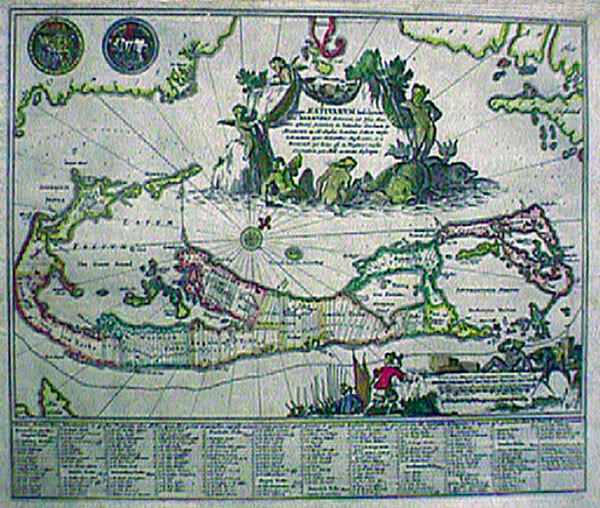 A most attractive variant on the Norwood survey map, complete with cartouches and vignettes of mermaids, sea monsters, seventeenth century Adventurers with flags and full dress uniform collaborating with Indians in the measuring and charting of the land they conquered. 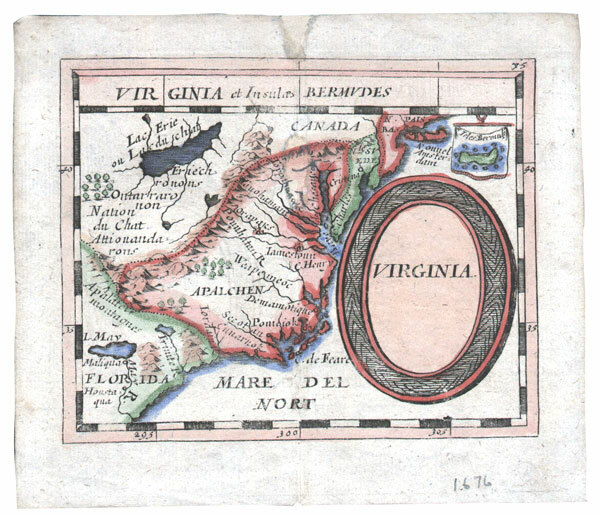 A variation in the watermark on this map was used by Montanus in 1671 and Von Meurs in 1673 in their respective atlases. Pieter Van Der Aa. 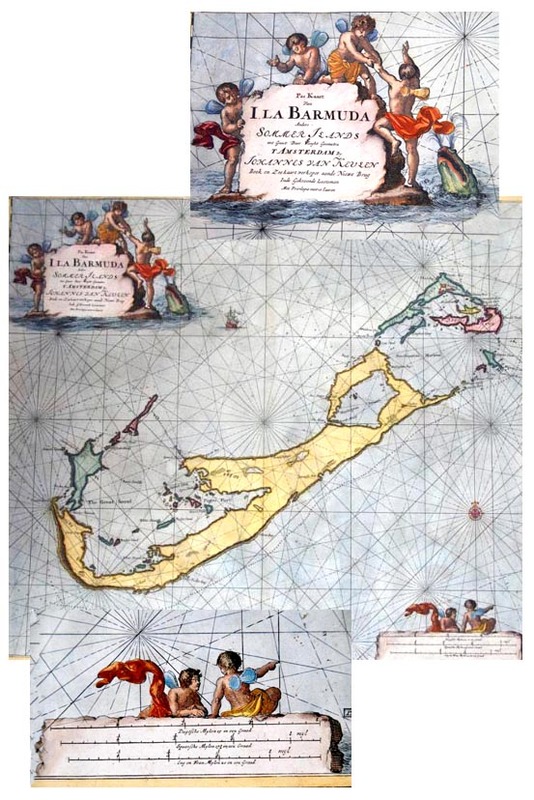 Very Rare Bermuda Map. Hand coloured. Strong impression. 14 x 12 inches. 35.5 x 29 cms. In 1729 Pieter Van Der Aa attempted something daring in terms of cartography. He published ‘La Galerie Agreable du Monde’ in Leiden, Netherlands, a set of 66 volumes of beautiful maps of the world. 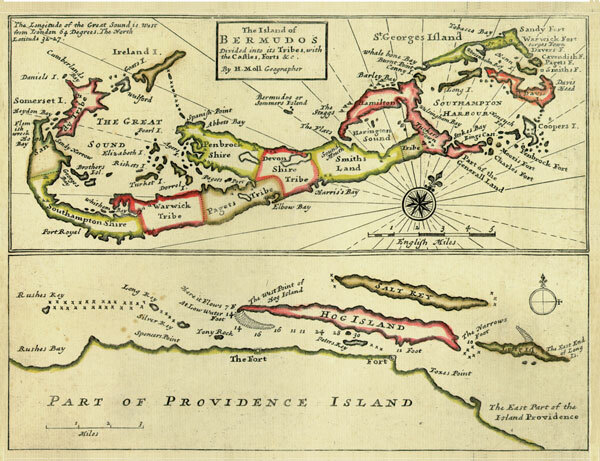 One of these was a totally new illustration of our island, complete with British gentry, American Indian and Black Bermudians surveying and measuring local topography. 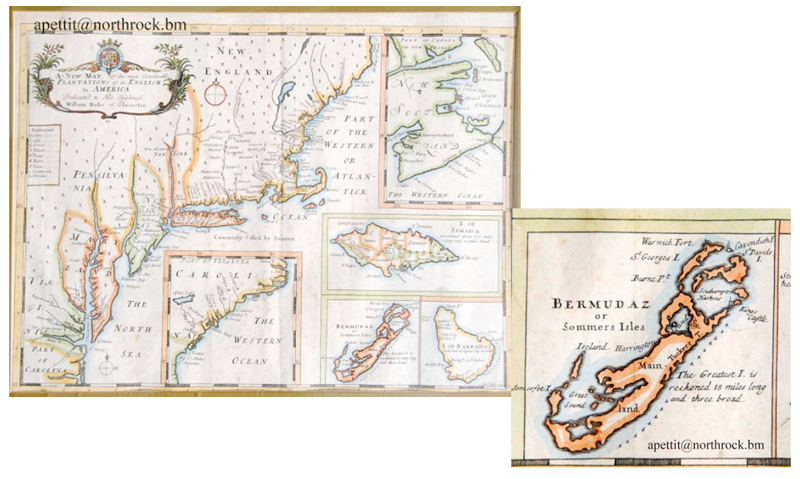 Only one hundred of these sets – which means 100 of the Bermuda maps – were sold, making this one of the most sort after for a collector. Philip. Bermudas or Somers Islands. 30.5x28cms. Outline colour. c1850. 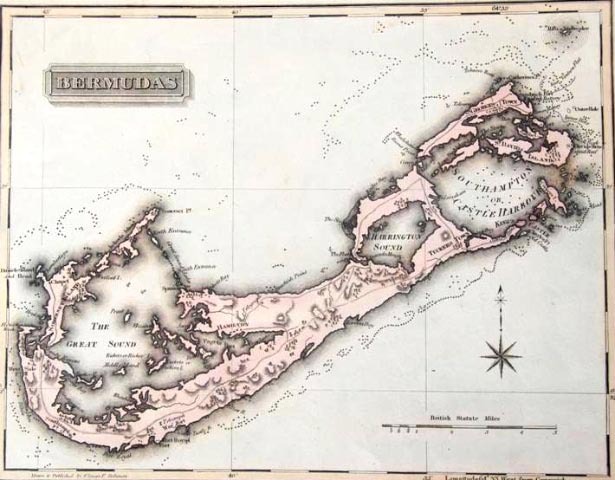 A derivative of the Thomson map of 1817 about which there is reference made later, this is the Bermuda portion only. Philip names all the parishes and decorates his map quite differently from Thomson. Rand McNally. 60x33cms. 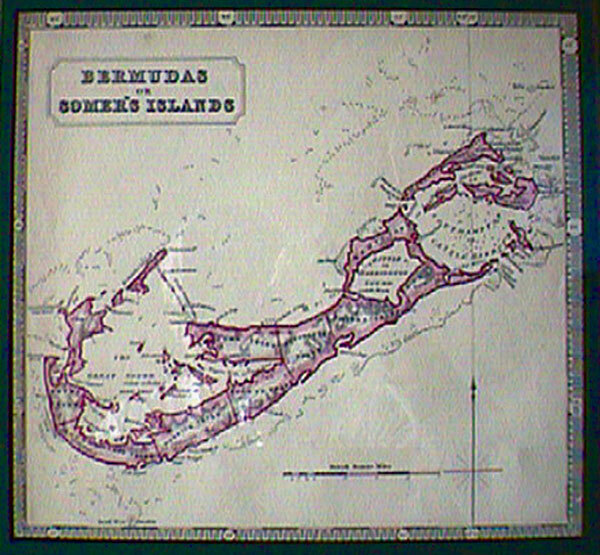 The Bermudas or Somers Islands appeared in the Commercial Atlas of America 1916. Full colour. Though the most modern map in the catalogue, the Rand McNally is not without its positive characteristics since it describes Hamilton Long or Bermuda Island and predates the railway or the building of the bases. Scherer, Heinrich (1628 - 1704). Scarce map of the British Isles, New England and Bermuda. Handcoloured. 9 3/4 x 14 1/2 inches. Fr. Scherer was a Jesuit geographer and professor of mathematics. He employed four skilled engravers to produce this atlas which was well received by the public. The date of printing being 1699 the Latin text on the left states that New England rejoices in many benefits and is still loyal to the Queen of England. This would have been Queen Anne. Bermuda (The Isles Bermudes) sits proudly below the monsters and sailing vessels. Senex. 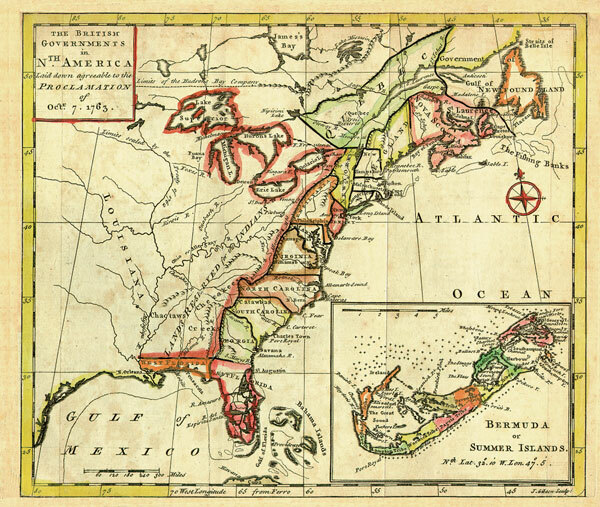 A New Map of the English Empire in the Ocean of America or West Indies. London 1721. 60.5x50.5cms.Outline Colour. Divided into eight irregular compartments, this plate shows six separate islands of which Bermudos forms a decorative portion in the left hand quarter. A well drawn geographical map. Speed. A Mapp of the Sommer Islands. 53x40cms. Hand coloured. Compiled in 1622 by Norwood, this was the first English map in an atlas to show the Island divided into Tribes and Lots, with the shares of the new Adventurers underneath. 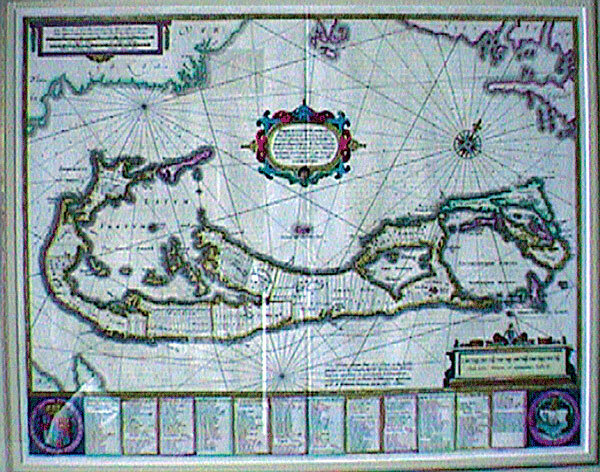 It became the standard map of the seventeenth century and was much copied by others. The engraver was Abraham Goos and the edition for sale, the 1676, was to be sold by Thomas Bassett in Fleet street and Richard Chiswell in St Pauls. Please note that Speed’s name never appears on the Bermuda map, only Goos. In other plates in the same atlas-notably some of the English counties his name is engraved. 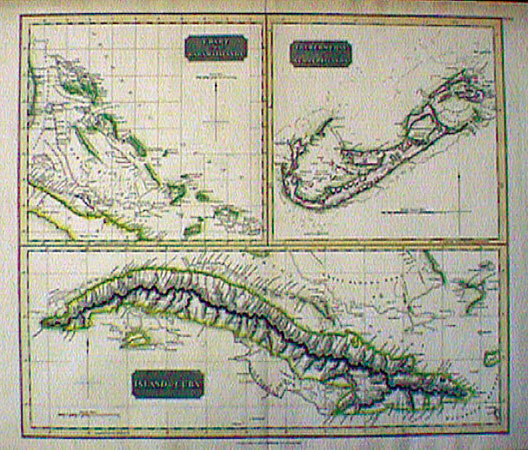 Stanford's Bermuda Map. Published by Gregory V Lee, the editor of the Royal Gazette, 1872. Hamilton, Bermuda. Engraved by Stanford’s Geographical Establishment, London. An unusual and colourful map of Bermuda showing the exciting activities happening on the island in the third quarter of the nineteenth century. There is a large hospital at Dockyard, a horse ferry at Watford bridge, a busy Admiralty Establishment in Pembroke, bustling steam ferry routes, the British Army presence in St Georges, a rapidly growing city in Hamilton. On the wider scale, Bermuda has regular and frequent connections with America, the West Indies and Europe, all clearly indicated on the map. Quite a centre of commerce. Swanston. 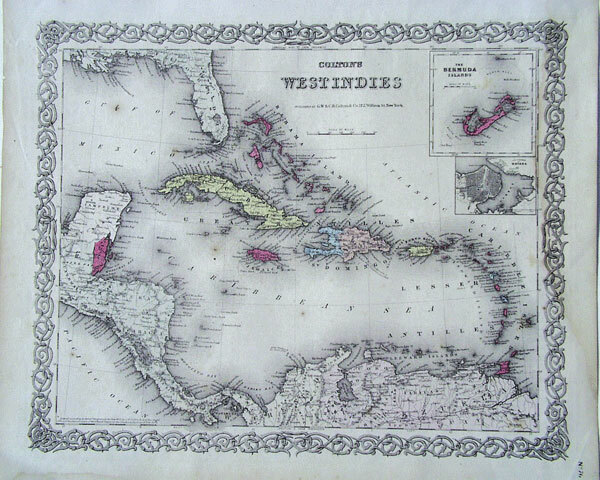 The West Indies. 1860. 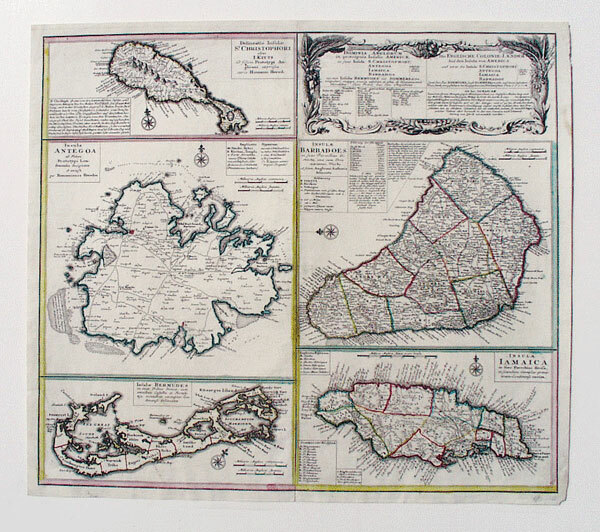 Bermuda appears as an inset of 7x7cms in this 53x42cm lithograph, published by A Fullarton and Co of Edinburgh. 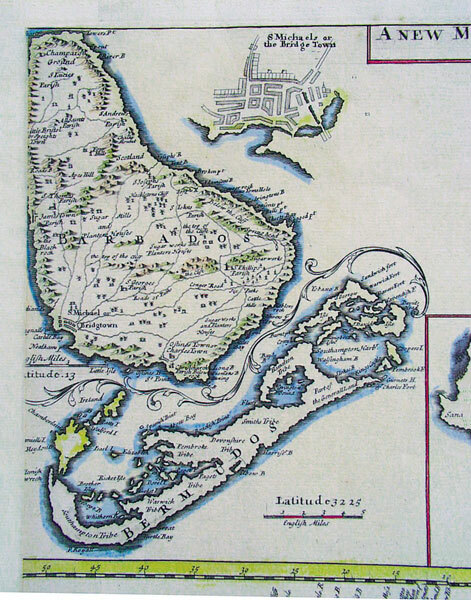 Tallis.Islands in the Atlantic. 22x31cms. c1851. Outline colour. Bermuda occupies the left hand portion of this map of some of the volcanic islands in the Atlantic. Appearing in the Illustrated Atlas and Modern History of the World, published in London, Tallis’ map has always been a favorite with collectors. Thomson. The Bermudas or Summers Islands (together with The Bahamas and Cuba). 60x50cms. London 1817. Outline colour. 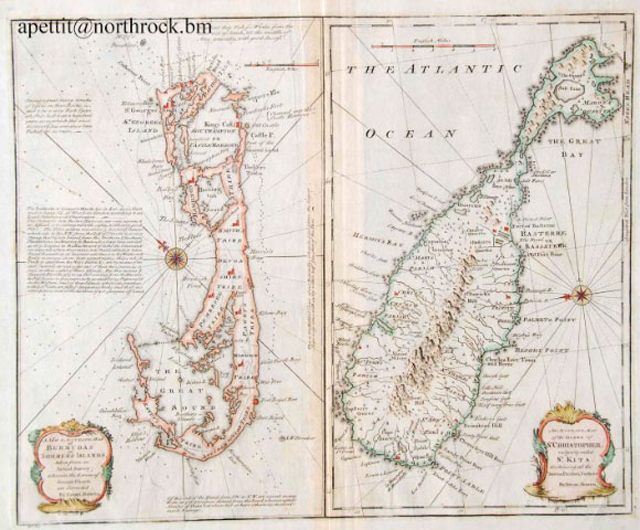 Bound into Thomson’s New General Atlas, Bermuda measures 29.5x27.5cms on this map engraved by Neele. Hamilton is shown as the capital and main roads and telegraphs are depicted. A new and innovative piece of cartography for its time. Weller. Islands of Importance. 39x46cms. Chromo-lithograph. 1857. This appeared in the Weekly Dispatch Atlas, 139 Fleet St. London. Bermuda measures 16x11cms and is attractively drawn but with no reef line. Wells. A New Map of the Most Considerable Plantations of the English in America. 48x35.5 cms. Original colour. 1700. Published and printed in London. 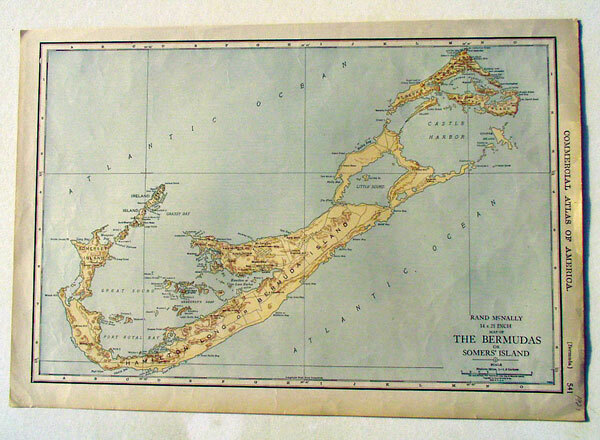 Bermuda is called Bermudaz and occurs as a 9x8 cm segment in this elegant map, engraved by Sutton Nicholls. Important also for its portrayal of New York and the Eastern Seaboard. Zatta. Le Isole Bermude. 42x31.5cm. (See front cover of catalogue). Original colour. 1775. 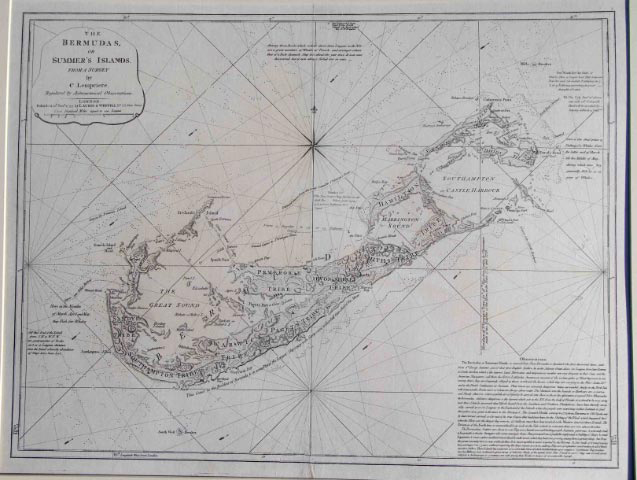 This striking Bermuda map has long been sought after by collectors, though on the face of it, besides inaccuracies in the map itself, Zatta seems to have been greatly misinformed about the island’s topography. There are beaver to be seen, Native American huts, exotic birds and a jungle atmosphere. Surely this is not the case on our island. 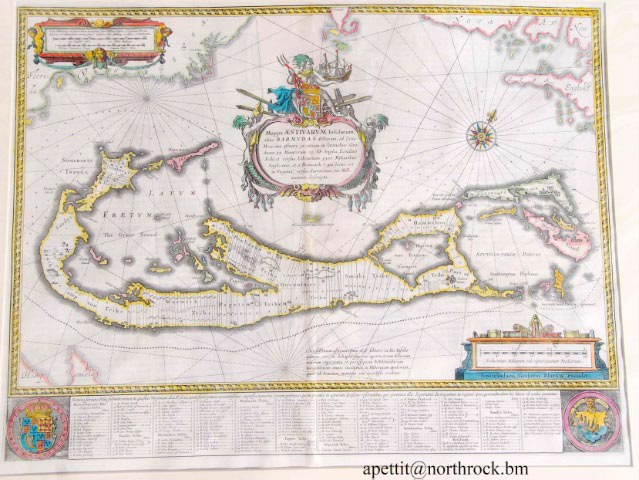 However, when it is realized that the Bermuda map is actually the frontispiece of an Atlas of North America, with us mere ornamentation on the first page, then Zatta’s purpose is clearer.